Biggleswade Town Band was, like most Town Bands, formed in the 19th century; probably sometime after the middle of the century. 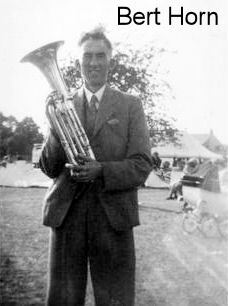 It was the custom for Brass Bands to add the term 'Prize' to their name after they had performed and achieved success in winning a notable competition at a recognised venue. Upon reading about the discovery of the Band's Bass Drum, found in the attic of Gamlingay Village College, I decided, as the last surviving member of the Band, at least as it was in the 1950's, to record what I know, or at least can remember, about those days in the Band. I was a member of the Band from the late 1940's into the 1950's, playing 2nd Trombone. I was encouraged to join the Band by my father, Bert Horn, who was a member from the early thirties to the mid sixties when it was decided that they should disband. The Trombone section, which included me, was lined-up just in front of the Drum Section at Band Practice; therefore I have strong memories of the Bass Drum. There were other Cornet players whose names I cannot recall. The Conductor, Joe Young, was a very experienced Band musician, having played in a number of well-known northern Brass Bands prior to coming to Biggleswade. Following him, Johnny Johnson, from the RAF Band at Henlow Camp, was the Conductor for a while. He composed a short piece of music called Biggleswade for the Band. I do not know whether the Band parts for this, or indeed the Band music generally, is still in existence. Later the position of Conductor was held by Fred Wall and then, following him, Bill Hudson. The Band was very active at the time I was a member. It led processions for Carnivals and similar events and Played at Fetes in and around Biggleswade. It also played in the former Bandstand in the Franklin Recreation Ground ("The Rec. "); (Photographs of the Bandstand may be seen in the Booklets Old Biggleswade Vol 4, page 84 and Bygone Biggleswade Vol 2, page 11). The Band also played on the Market Square and, at Christmas time would go around the town playing Carols under the street lights. 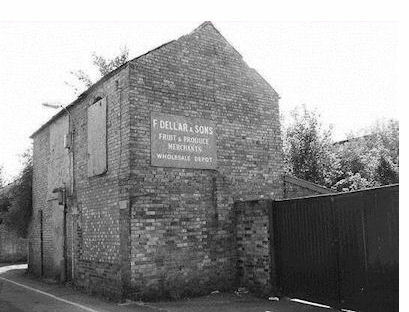 Tec Chambers, who was a Town Councillor, was very fond of the Band and when it played at Christmas time he took charge of the collection box and went in the pubs adjacent to where the Band was playing. Being well-known and well-liked, Tec always managed to collect much more money than any other collector. Tom Perryman was the Band's Secretary for many years. I can remember him walking around the town on some evenings to inform Committee members (including my father) of changes in date of Committee meetings. This was necessary because at that time few, if any, of the Bandsmen had a telephone at home. His son, Charlie Perryman, was the Band's Librarian. Charlie was responsible for keeping the sheet music, all the parts for each instrument, filed away in a tall wooden cupboard, and also handing out the appropriate parts to the players. Following the death of Ted Robinson, Les Arger played the Bass Drum for a while. I remember on one occasion, in a Carnival procession, he hit the Drum so hard that the Drum-stick went through the skin on the side. This of course caused a certain amount of amusement. I 'inherited' Ted Robinson's uniform, being about the same height and size, but the peaked hat was on the small size for me, as can be seen in the photograph on Page 42 of the History Society Booklet, Old Biggleswade Vol 3 and at the top of this article; I am in the centre. The earliest record of Biggleswade Town Band seems to be in 1887 when they took part in the celebrations of Queen Victoria's Jubilee, as shown in the photograph in the Booklet Bygone Biggleswade , page 36. The Band is also mentioned in a report, dated 6th December 1890, in which Biggleswade Brass Band and Biggleswade Drum and Fife Band played on a Mr Power's lawn at Caldecote, to celebrate his return from Bedford Prison. It seems he was thought to have been improperly imprisoned. Later, in the years prior to the First World War, my fifth cousin Jane Croot nee Albone informs me, there were five Albone brothers in the Town Band. These five were the sons of Charles Albone of Palace Street; they were Arthur Charles Albone (known as AC), who was the Bandmaster or Conductor, and his brothers Fred, Charles, Bert and George. Later still, in 1935, Bandsmen are shown in two photographs (in Old Biggleswade Vol 5, page 57), marching in the High Street and later attending a dinner in the Drill Hall. During the late 1950's the Band uniform was considered to be old fashioned and unsuitable for the time. 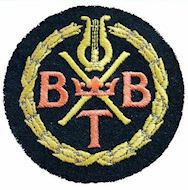 Instead the Bandsmen were fitted out with blazers with a distinctive blazer badge (see photo). Unfortunately the Band had to disband during the 1960's because of the decline in membership. 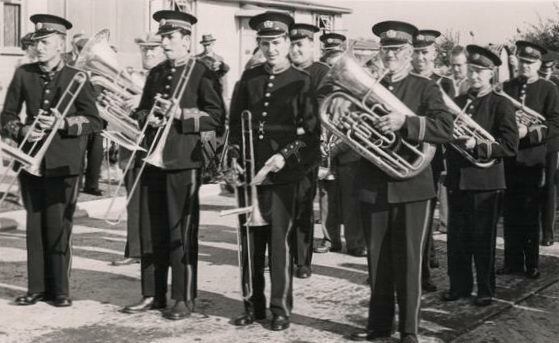 The Bandsmen were permitted, if they wished, to retain their instrument, which a few did, but most of the instruments were given to a Sandy School Brass Band. It must be admitted that some of the instruments were in less than tip-top condition. During the final years of the Band a few young people, including girls for the first time, joined the Band, but there were not enough new members to keep it going. In the sixties most young people were more interested in the pop music played by the Beatles and other groups.